This is simply small dice bread that are fried until crisp. 1. Heat oil and butter in frying pan over high heat. Add bread. 2. 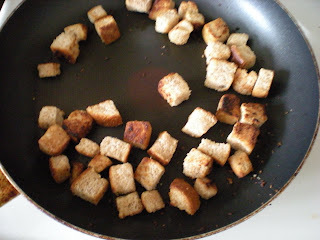 Shake pan so croutons color and cook evenly. 3. Spoon them out onto paper towels and pat dry.